The carrier Dwight D. Eisenhower began a six-month Planned Incremental Availability at Norfolk Naval Shipyard in Portsmouth, Va., Monday — coincidentally, the 33rd anniversary of the flattop’s commissioning at Norfolk Naval Station’s Pier 12. 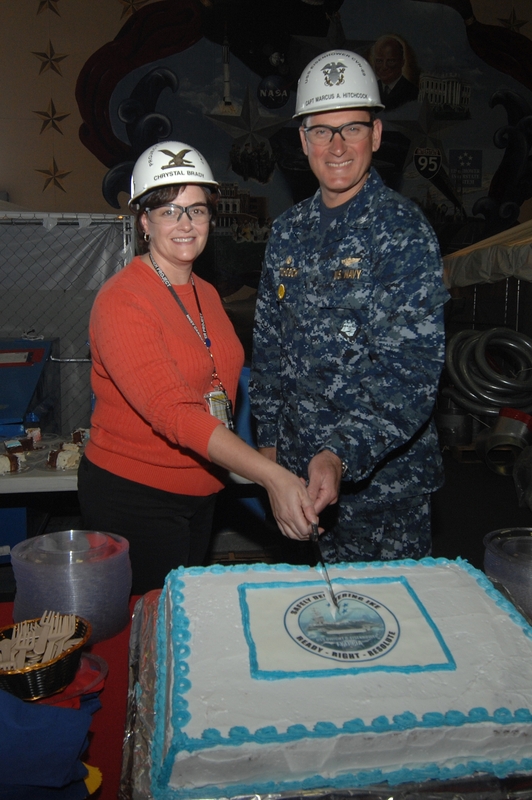 The scheduled but much-needed maintenance and modernization period follows an extraordinarily busy time for Ike, which came home July 28 following the second of two nearly back-to-back deployments in a 17-month period — the so-called “double-shot.” During the cake-cutting ceremony marking the occasion, shipyard project superintendent Chrystal Brady said the period will be the “largest PIA ever done” in six months; Capt. Marcus Hitchcock, Ike’s CO, told the crew and workers Monday that “teamwork, energy, dedication, respect and most importantly, integrity” will be the keys to enable the civilian-military team to get through the project “smoothly and on time.” Ike is slated to return to the fleet in April.